Driving Serious Newspaper Ad Sales: A huge sale to an antiques dealer during the dog days of summer! A huge sale to an antiques dealer during the dog days of summer! Have you ever had one of those days (or weeks or months!) where it feels like nobody new will ever buy an ad from you again? Yesterday, I got a call from a client I've been working with this summer who had just sold this 5 col. x 15" ad on a 13-time contract using the techniques they learned from our ad sales training program. It started simply as a cold call to an antiques dealer who had never advertised before. Eliminate the upfront stalls and objections and stop the prospect from thinking about how to get rid of you by agreeing with them when they say you're too expensive or your newspaper doesn't work or they have no money due to the recession (you'll clarify that later once they're not focused on getting you to leave). You can even show them an example of an advertiser who previously had difficulties with your newspaper. Sounds crazy, I know. Explain how you eventually helped the example advertiser drive some serious revenue using our proven advertising techniques. This usually buys you a couple of more minutes of their time. 3. Move from "vendor" to "partner"
This is where the big change takes place. Use the Socratic method to draw out of them the actual response techniques you used to help your example advertiser. If you do this properly, they'll begin to realize that you can actually have a dramatic impact on their business, instantly transforming your relationship from the "vendor" to the "partner" mode. It'll also clear out all the incorrect theories that are getting in the way of them running, and running the right size, frequency, and content and replace them with better ones. We call this little lesson the "Response Model". Later on, during the second sales call, you'll find this invaluable when selling the ad. Offer to come back with a new recommendation, including a spec ad, but explain you need to know more about them first. At this point, and really only 3 minutes into your first meeting, you've established a solid relationship with a previously-disinterested prospect and you're well on your way to closing a major sale. Get the information you need to return with a killer recommendation, like the one in this post. This ad rep hung in there during a tough day and it wasn't long before a prospect responded to the approach. In this case, he sent materials through to our overnight design service who helped created this ad for the him but there's no reason your designers can't create the ad. The next morning he brought it out and made the sale. During slow days, the key is to not get discouraged but to continue working the system and remain confident that your prospects desperately need someone like you to come in and help drive their sales. They just don't believe when you first walk in. Initially, they're going to think you're like other media salespeople simply focused on selling them an ad, so graciously push aside the initial upfront stalls and objections and explain you're there to help drive customers to them and you have the unique skills to create an ad strategy that'll actually work. 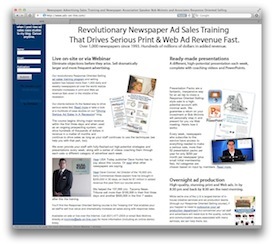 Besides conducting my Response Oriented Selling training, I've been personnally selling large advertising contracts for my newspaper clients as a "hired gun" for a few years now (which has now evolved into my on-demand Presentation Packs coaching service where I walk you through the entire sale, 52 times per year for a different category of advertiser). Once a prospect sees a solution that makes sense to him, its amazing how quickly he opens up about how much pressure they're under to sell their own products and that this is the perfect fit. This is just a little piece of my Response Oriented Selling course, but hopefully it will help you refine your cold-calling approach and shed a little light on how we can teach your newspaper how to take small or non-existent advertisers and get them spending major revenue, on contract, literally overnight--even in this economy. So, don't get discouraged and make sure you focus on what the prospect really wants to talk about--response--and you should find local businesses opening up their wallets even when they swore they wouldn't. Contact me if I can help in any way.